The only way to keep a kitchen good as new is to never use it. Even the most careful cook will spill stew from her ladle or have a pot boil over. 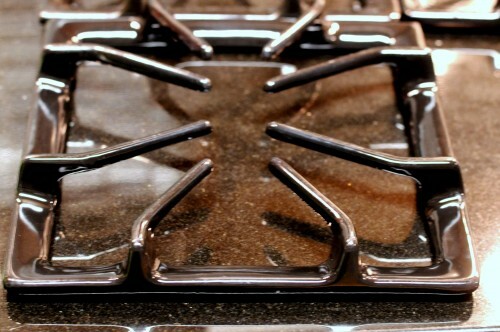 Regardless of one’s cleaning prowess, these drips and smears accumulate over time and produce a hardened combination of food and grease residue that even the best scrubbing cannot remove. 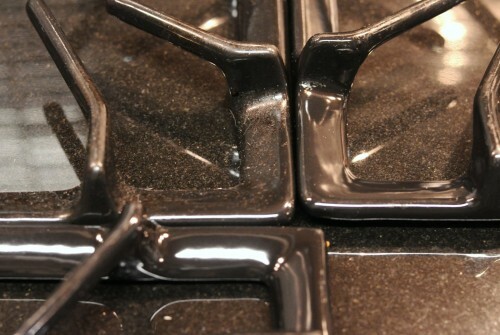 Here is one of our stovetop grills. 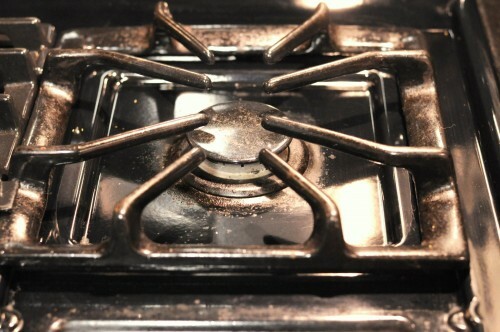 Notice the buildup of grease. We’ve tried cleansers, hot water, the dishwasher, but we could not get rid of this accumulation over four years of daily cooking. Years of caked on residue that’s been impossible to remove. 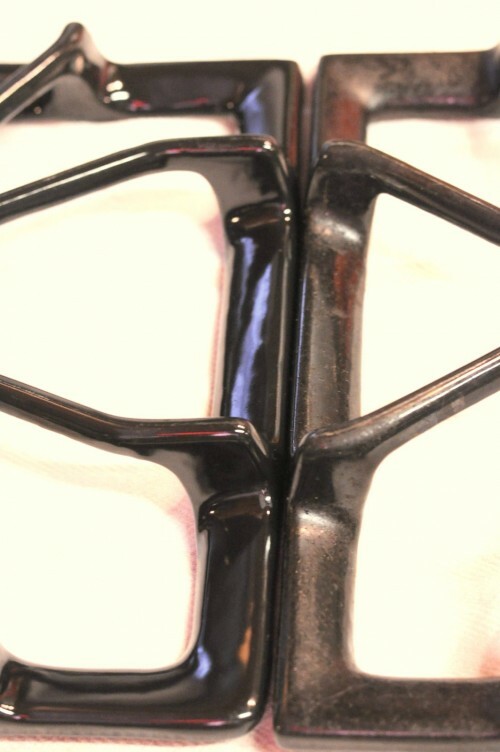 Cleaned grill on left, and dirty grill on right – the clean one is like new! It’s a miracle! You won’t believe it until you try it. Thankfully Pinterest does have its benefits other than an overload of fashion ensembles and wedding decor ideas. I got the idea from this blog, who got it from this blog, that simple ammonia will get rid of these residues as if they were fresh spills. 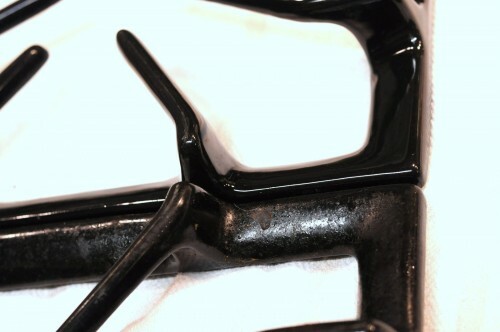 The idea is to seal the grill in an airtight container with a small amount of pure ammonia to expose it to the fumes. All you need is ammonia and a Ziploc bag. 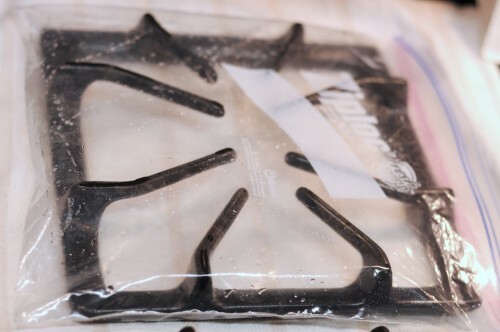 I put a stove burner grill in a Ziploc bag and sealed it with 1/4 cup of ammonia for 12 hours. This is a very smelly procedure that is best implemented outdoors, but apartment dwellers as myself do not have that luxury so just make sure that you seal the bags securely and you’ll be fine. Before (upper left) and after (others). 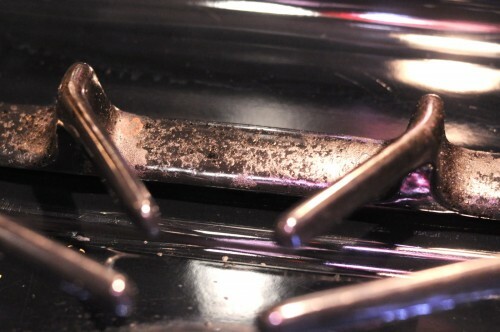 This entry was posted in DIY and tagged ammonia, cleaning, grills, home on April 30, 2012 by admin. I AM impressed… How cool is that! this is awesome! 🙂 I cant wait to try it! 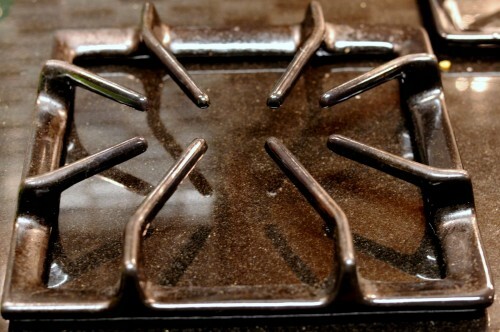 I will be using this tip to clean my stovetop grates. Even though they are not too bad yet but even a few months makes them disgusting. Great idea! your blog. I as well am an aspiring blog writer but I’m still new to everything. Do you have any tips and hints for first-time blog writers? I’d genuinely appreciate it.